Swiss Air Lines cheap flights France to Buenos Aires, Argentina €421! Return and open-jaw flights from Paris to Uruguay from €356! Swiss Air Lines cheap return flights to Argentina with just one short layover in Zurich on your way next winter season. Good deals to South America are not that common so any good solution from Europe should be always appreciated. Return flights from main airports in France to Buenos Aires are now available from €421. Incl. all taxes, in-flight meals and checked-in luggage. You can book the cheapest flgihts to Buenos Aires when departing from Nice, Bordeaux or Paris. Flights are available in first quarter of 2019 (local summer). This is popular season to visit Argentina and considered as peak tourist season..Promo sale is based on service of Swiss Air Lines / Edelweiss. Swiss International Air Lines promotion is available from 3rd of March to 23rd of June or 14th of August to 17th of November 2019. Max stay 3 months. Discount is avalid for bookings made by 27th of September or until the cheapest class lasts..Below you can refer to our booking sample from each of the French cities. You can compare connecting flights to one of above cities from your hometown using Skyscanner tool. 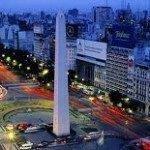 Need an accommodation in Argentina we recommend Hotels.com. or Booking.com. Booking sample of discounted Swiss Air Lines cheap flights France to Buenos Aires, Argentina €421! Date of your outbound flight from Bordeaux to Buenos Aires Ministro Pistarini airport would be on 3rd of March. Inbound flight from South America back to Europe then on 18th of March 2019. Do not miss this latest Swiss Air Lines promotional sale and book discounted round trip flights to Argentina next peak season..